To effectively promote its North American businesses – a complex mix of consulting, technology, and outsourcing services – Paris-based Capgemini drew its PR operations under one umbrella in January. The new unit, North American external communications, was assembled to provide “a one-voice message to the market and to align effectively with all of the other tasks associated with integrated marketing,” says Lisa Boughner, who previously led PR for Capgemini's North American outsourcing business. With 9,000 employees and accounting for 20% of the company's overall revenues last year, Capgemini's North American operations continue to grow since tripling in 2000 as a result of its Ernst & Young Consulting acquisition. Globally, the company sprawls 36 countries, staffed by more than 86,000 consultants, IT specialists, and outsourcing experts serving the automotive, consumer products, energy, utilities and chemicals, government and manufacturing, and other industries. The overall external communications mission is to ensure an ongoing presence and share of voice, in order to influence buying behavior by shaping industry issues. “This objective includes elevating our market and mindshare to levels more closely resembling our European presence and surpassing key competitors,” Boughner says. 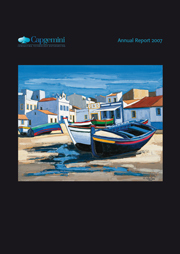 For example, the PR team recently launched an initiative to publicize the cost savings and infrastructure benefits of Capgemini's business process outsourcing services in North America – resulting in articles in Investor's Business Daily, The Wall Street Journal, Bank Technology News, and other publications. At Capgemini, the role of external communications is much broader than traditional PR. This expanded role encapsulates message development, thought-leadership planning, securing client references, and media relations, while closely aligning PR with marketing. To position Capgemini as a thought leader, the team leverages the company's market research, content from its executives' blogs, and arranges interviews with its industry experts. Helping the three-person North America external communications team (with a support staffer in Mumbai) is AOR Weber Shandwick. Moving forward, Capgemini's PR team is determined to overcome the challenges associated with representing the North American operations of a French company. While the company is widely known throughout business and media communities in Europe, the same cannot be said in North America.